This tiny functioning kaleidoscope twinkles with vibrant sea glass and mineral gems. This necklace can brighten any day with a captivating swirl of color. 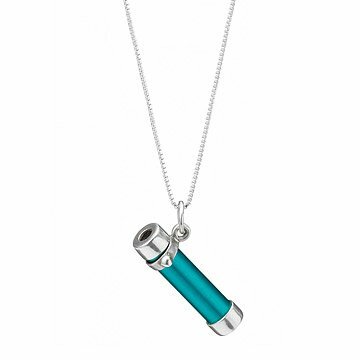 Its teal blue pendant of anodized aluminum actually contains a miniature, fully functioning kaleidoscope. Kevin and Deborah Healy's handcrafted little wonder has three mirrored surfaces inside that reflect a shifting tapestry of vibrant colors, provided by tiny grains of sea glass, recycled glass and mineral gems. The pendant's sterling silver accent hardware is both lovely and functional--simply hold the rotating silver band between two fingers as you turn the tube and peer inside at the snowflake-like patterns within. Hangs from a sterling silver chain. Handmade in the USA. I really like that it works like the normal sized kaleidoscope. This is amazing. You won't believe how many different kaleidoscope views you get. You won't believe how much you don't know how to spell kaleidoscope. Seriously, I love this. I put it on a bit longer chain and like to wear it daily and take a moment out of my day - several times to day - to just chill and look at the tiny, beauty. Purchased one last year and her fellow owners loved it. Now all three of them have one. They love them. A really unique, amazing work of art. I can't believe a kaleidoscope this small actually works! It didn't have the fabrication precision of the sterling kaleidoscope. The ring around the cylinder seemed a bit too large. The viewing was equally spectacular though. Such brilliance! I can't get enough of this necklace! I received one as a valentine gift and now am purchasing one for all my young adult granddaughters. It's just so fun; kaleidoscopes are never boring. Beautifully made, and a gift they can treasure. I was looking for a special 50th birthday present for my wonderful woman, who just happens to love kaleidoscopes. She absolutely loved it! It made her laugh and cry and she can't say enough about it. She shows it off to everyone she meets, and they all love it to! The kaleidoscope itself works beautifully and has excellent colors and craftsmanship. Such a beautiful and functional piece of jewelry. Exquisite! You will not be disappointed! I gave this to my son's significant other who I cherish. She is a very special person on several levels and she loved it. How will I top this gift next year? I bought two of these. One for my 14 year old daughter & one for my 10 year old daughter. Both of them loved these necklaces so much! They even discovered that if you it up to the camera of the iPhone with the flash on, and take the picture, it will take a crystal clear photo of the image you see in the kaleidoscope. It was amazing!!!!! At first I thought the price was high (the shipping was high), but the necklaces were completely worth the price. I loved that they were not heavy! I knew they would be annoying if they were heavy. Perfect length. I can't say enough good things about them. I wish uncommon goods would have offered free shipping for Christmas or some sort of a discount for their loyal customers. But, still, I enjoy this store very much and will be back!